This year’s forecast is about average and much more subdued than last summer’s hyperactive season turned out to be, partly due to cooler ocean temperatures in the tropical Atlantic, as well as a nascent El Niño pattern. But that doesn’t mean an individual storm won’t blow up to exceptional strength, as Andrew did before striking Florida in 1992, an otherwise relatively quiet year. Heat trapped by the increasing concentration of greenhouse gases in the atmosphere is raising the chances of that happening, said Penn State climate scientist Michael Mann. 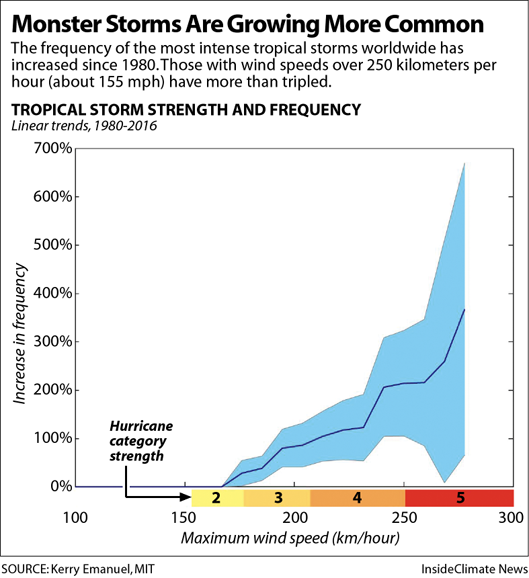 A new review of global data on hurricanes shows that since 1980, the number of storms with winds stronger than 200 kilometers per hour (124 mph, or a strong Category 3) have doubled, and those with winds stronger than 250 kilometers per hour (155 mph) have tripled. Super storms are growing more common. The analysis, published this week by four prominent climate scientists, also shows other clear trends, including a poleward migration of the areas where storms reach peak intensity, which puts new areas at risk, including New England and even Europe. Storms are also intensifying more quickly, with a greater chance they will drop record amounts of rain, especially if they stall out when they hit land, as Hurricane Harvey did in Houston last year. 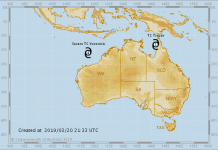 “The weight of the evidence suggests that the 30-year-old prediction of more intense and wetter tropical cyclones is coming to pass. 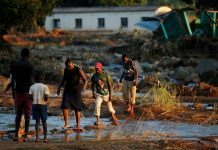 This is a risk that we can no longer afford to ignore,” wrote the authors—Stefan Rahmstorf of the Potsdam Institute for Climate Impact Research, Kerry Emanuel of MIT, Jim Kossin of NOAA and Mann. “The current intensity scale doesn’t capture the fact that a 10 mph increase in sustained wind speeds ups the damage potential by 20 percent,” Mann said. “That’s not a subtle effect. It’s one that we can see.” Based on the spacing of Categories 1-5, there should be a Category 6 approaching peak winds of 190 mph, he said. Creating a new warning level for unprecedented storms could help save lives. When Typhoon Haiyan, one of the strongest tropical cyclones on record, hit the Philippines in 2013, people died in shelters that had been designed to withstand a historic storm surge but still flooded. This year’s Atlantic storm season didn’t wait for the official June 1 start date: Alberto became one of very few tropical or subtropical cyclones to enter the Gulf of Mexico in the month of May. 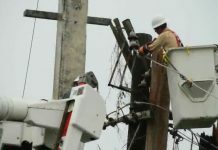 The storm reached peak intensity with 65 mph winds on May 28, passing through offshore oil and gas drilling areas and forcing some coastal evacuations. It maintained subtropical circulation features all the way north to Indiana. The National Oceanic and Atmospheric Administration, in its outlook for the 2018 Atlantic storm season, is projecting an average to above-average season this year, with 10-16 named storms and, five to nine hurricanes, including one to four major hurricanes. Colorado State University, which also issues a key hurricane outlook, revised its expectations downward slightly this week. The forecasters said they now expect an average hurricane season, with 14 named storms (including Alberto), six hurricanes and two major hurricanes, with a 51 percent chance of a major hurricane making landfall somewhere in the U.S. The CSU forecasters said their revision was partly based on cooler-than-normal ocean temperatures off the western African coast. That means there is less heat available to fuel hurricane formation in a region that spawns some of the strongest storms, including Maria and Irma in 2017, which became the two costliest Caribbean hurricanes on record. 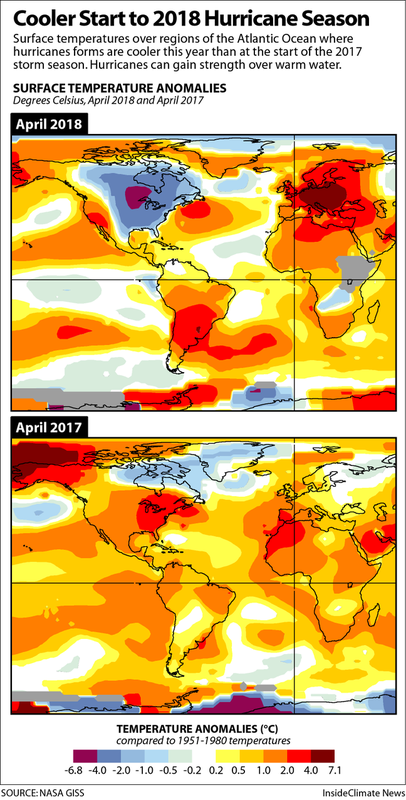 Last year, April sea surface temperatures in the eastern tropical Atlantic, a main hurricane formation area, were about 1-4 degrees Fahrenheit above average, helping to fuel the seemingly endless chain of tropical systems spinning toward the Caribbean and East Coast. This year, sea surface temperatures in a large part of that formation area are about 1 degree Fahrenheit cooler than average, part of a short-term cyclical ocean change driven by currents and winds. Cooler start to Hurricane season 2018. Long-term, sea surface temperatures in this region have warmed about 0.5 to 1 degree Celsius in the past 100 years. 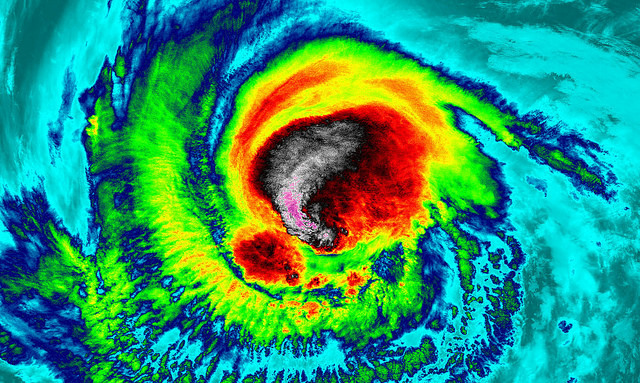 According to a 2008 study published in the journal Nature, warming oceans were responsible for approximately 40 percent of the increase in hurricane activity between 1996 and 2005, a particularly active hurricane period. What happened in Puerto Rico after Hurricane Maria is one example. The storm resulted in the greatest estimated loss of life on record from any storm in the U.S., with estimates of over 4,600 deaths, many from lack of access to medical care in the weeks and months after the storm, according to a new study published in the New England Journal of Medicine. The question is how to prepare, and in many parts of the U.S., existing disaster recovery programs are resulting in infrastructure being rebuilt in harm’s way, without consideration of how global warming will intensify impacts, said Jessica Grannis, adaptation program manager with the Georgetown Climate Center in Washington, D.C.
“There are bad recovery decisions being made,” Grannis said, using the impacts of Hurricane Irene in Vermont as an example. During the Obama administration, the federal government had started shifting policies to consider climate risks, but now we are “back in scenario of putting in things we know won’t be adequate,” she said. Whether climate change or weather engineering, Hurricane Season 2018 is anomalous. It started with Alberto, one of very few tropical or subtropical cyclones to enter the Gulf of Mexico in the month of May. And as stated above, super storms are becoming stronger and more common. So just be prepared! CFAN (Climate Forecast Applications Network), on the contrary predicts a below normal 2018 Atlantic hurricanes season. En effet c dur de se décider! God can protect you abd your loved ones suppernaturaly. Don’t wait till the last minute to evacuate. Third , buy flooding insurance.